Those of you who have been following me on here lately would be completely justified in having the impression that all I think about is food. And yeah, that’s pretty much the case. 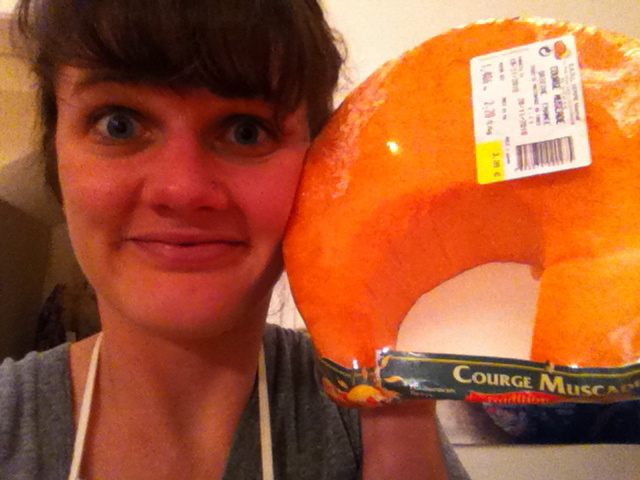 Buying groceries gets pretty exciting when it’s the only purchase you can possibly justify. It’s not just that I suffer from an unfortunate combination of poverty and gluttony, though. 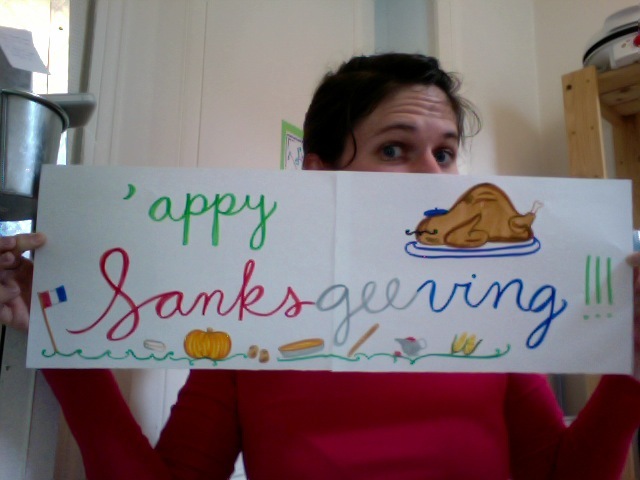 Considering I’ve spent the past two weeks explaining Thanksgiving to French children, I couldn’t help but get a little obsessed with it. 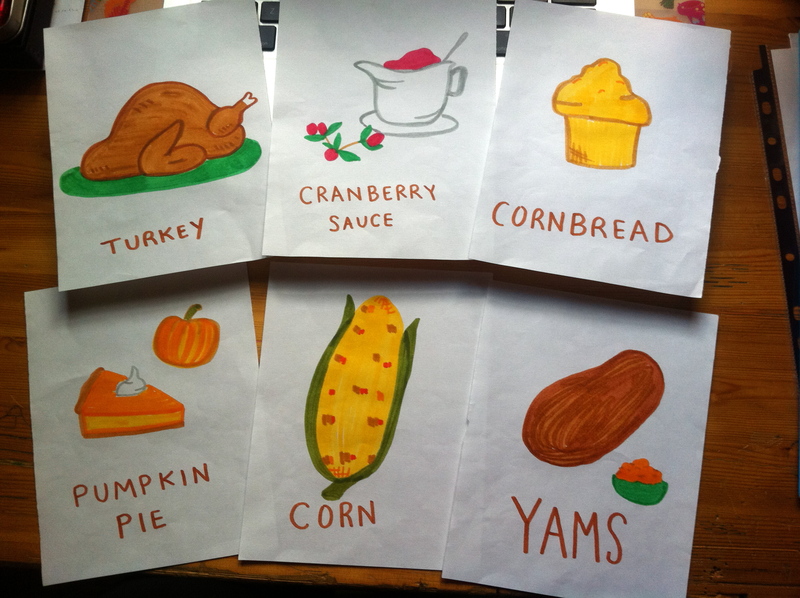 My younger students got a worksheet, too, but all they had to do was label the Thanksgiving foods that we went over. So with all that turkey talk on my mind, I had to do some cookin’. As the recent post in which I gushed about the delight of simple meals would attest, my “cooking” usually just involves a few ingredients that have to be steamed or sautéed. From time to time, though, I enjoy taking on a big, labor intensive challenge in the kitchen. Last Thanksgiving, for instance, never having roasted so much as a bell pepper, I roasted the turkey. I had certainly never dealt with the carcass before, but that didn’t stop me from boiling it down for turkey noodle soup. Since then, I’ve also made tiramisu—which is a freakin’ lot of work!—as well as ketchup, which is just something you don’t even realize that anyone other than Heinz can make. Like ketchup, it only recently occurred to me that pumpkin pie is something a person can make. I had always kind of wondered how pumpkins could possibly be turned into the stuff in the pie. I imagined that it demanded machinery too big for a single home’s kitchen, which is why Americans just buy their pumpkin pies—and also why 90% of the pumpkin pie I’ve consumed in my lifetime has been mediocre. 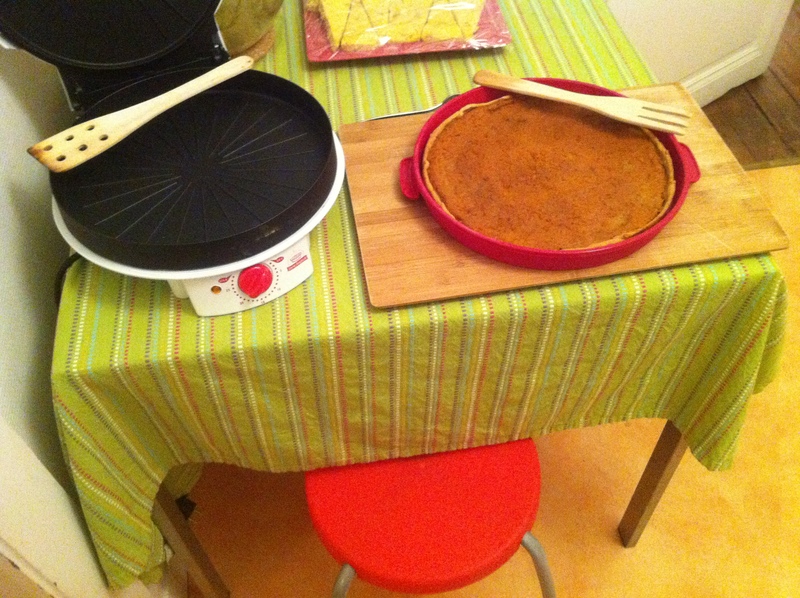 So now that I live in France, where I have a tiny kitchen that lacks an oven and where pumpkin purée is nowhere to be found, what better time than the present to make my first pumpkin pie? I started out with two big hunks of some variety of pumpkin that, if whole, would resemble the one that took Cinderella to the ball. 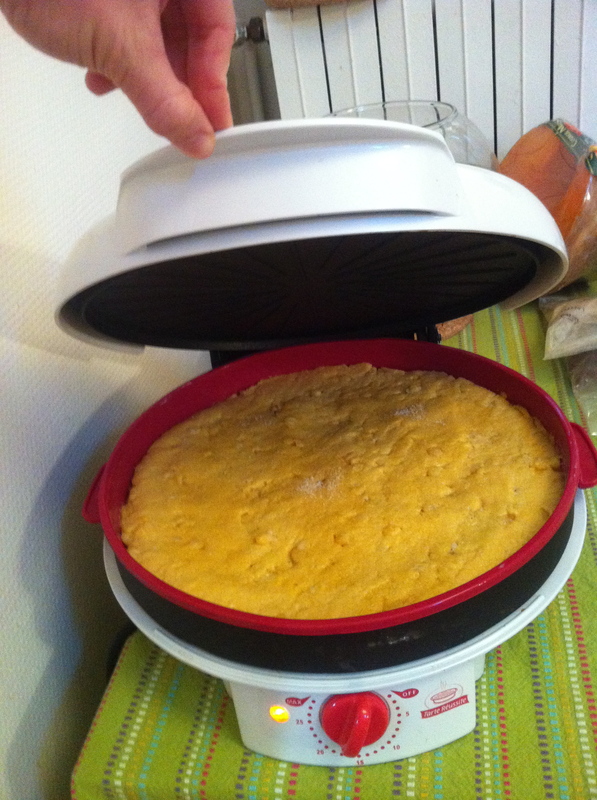 So as a test run, I made cornbread, which was indeed a success. While that was baking, I made the pumpkin purée. As it turns out, it’s no big deal. 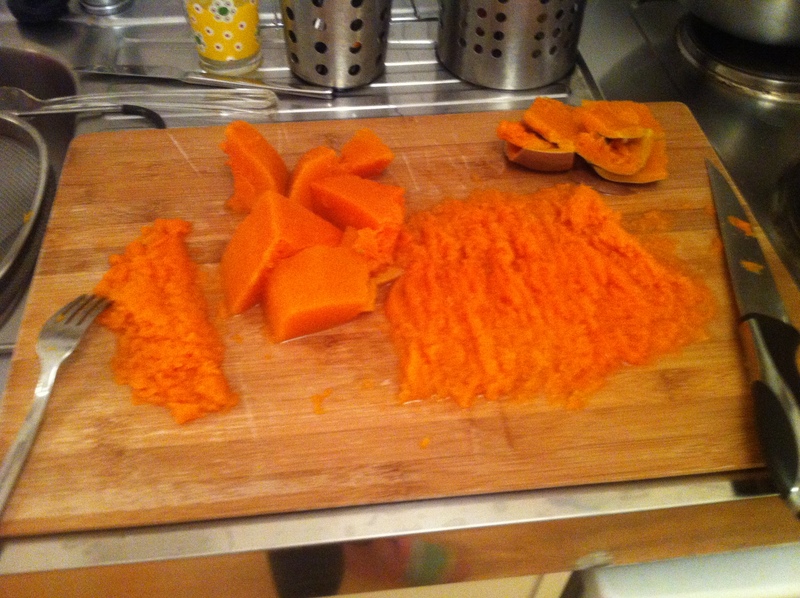 If I’d had any microwave-safe dishes big enough to contain 2.5 kilos of pumpkin, it wouldn’t even have taken very long. And about an hour in the Pie Success later, ta-da! A pumpkin pie made from actual pumpkins in a completely inappropriate kitchen. Note the mise-en-scène, which was arranged specifically to reflect my feeling of accomplishment. Riding on last evening’s creative vibe, I spent this morning playing with markers. 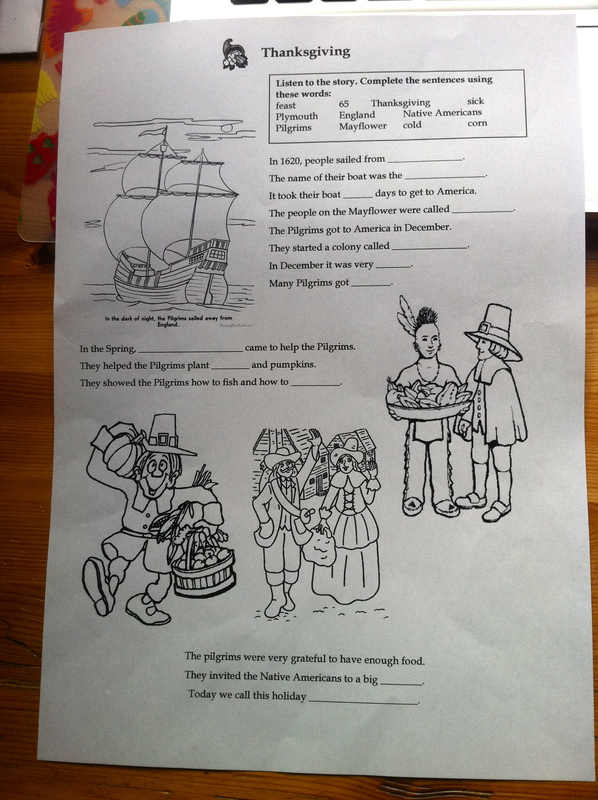 This entry was posted in Uncategorized and tagged coloring, gluttony, teaching. Bookmark the permalink. hello! it’s caitlin. those signs sure do look familiar….